My grandmother, grandfather, mother, me, and my sister (I think). My dad was probably taking this picture. Some of my favorite memories revolve around Thanksgiving. 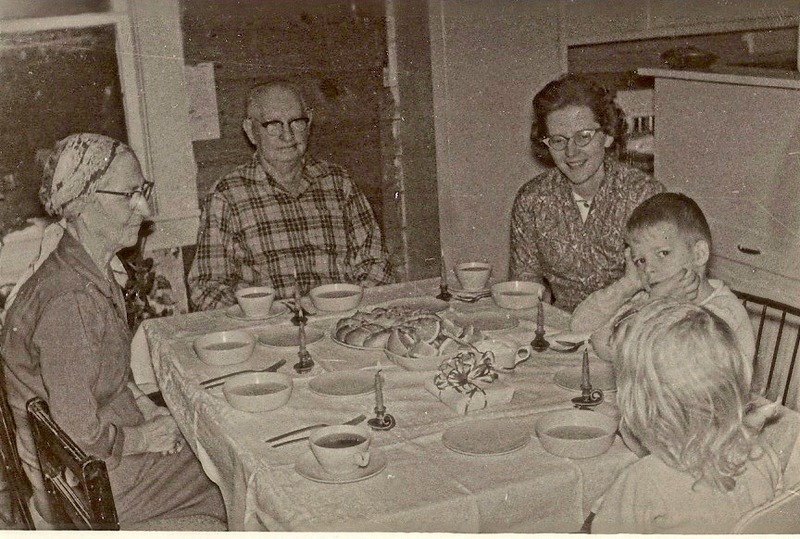 I can still picture my grandfather as he looked up from a meal, patted his stomach, and said, “Best meal I ever had.” My mother recounts her resolve to become a better cook because of the constant praise and encouragement from her father-in-law. Whether a cool drink of water or a Christmas gift made by a grandchild, he always said a heart-felt thank you. When I was a junior in high school my work and school schedule caused me to be at home for Thanksgiving while the rest of the family was out of town. I was to have Thanksgiving dinner with my grandfather in the nursing home. I visited him often but was not excited about having dinner there. He had very limited speech because of a stroke, but as we sat quietly eating our Thanksgiving meal I began to think of all the gifts this great man had given me. He had taken me on long walks, shown me where old family historic places were, told me hunting stories, and taught me the names of plants and trees. I was overcome with a sense of thankfulness for his life and his influence. This quiet meal with my grandfather has become one of my favorite Thanksgiving memories. Today I am thankful for my family and friends. I’m thankful for having meaningful work and great people to work with. I’m thankful for the children whose lives we can touch and make a positive difference. I hope this Thanksgiving will be a time of reflection and joy as we give thanks and make new memories. News Alma Intermediate 1114 Open this link to read the newsletter. By ozarkmountainhiker in Uncategorized on November 22, 2014 . Thank you for sharing your memories, Jim. I share most of those memories and cherish them as well. Phyllis and I were just discussing Grammie’s turkey gravy, and regretting that we didn’t learn her method. Thanks to Grammie and our mothers, those were always meals fit for kings and queens!